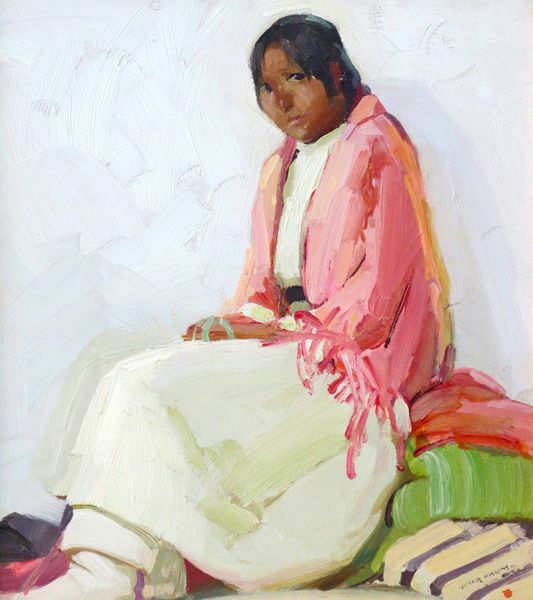 "On the Way Home" "Flowers"
17 7/8" x 13 7/8"
Oil on canvas, 25" x 17"
"Courtyard in Desert" "Afternoon Shadows"
Higgins said Taos captured him "because of the light. There is the best light to be found anywhere. There is more color in the landscape and the people than elsewhere. And besides this there is the constant call here to create something." the knowledge that Here is the oldest of American civilizations. 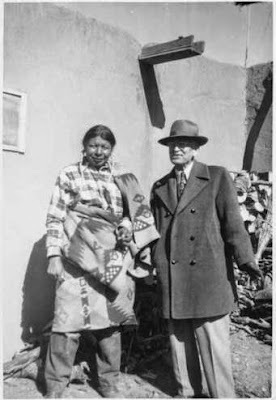 The Taos Indians are a people living in an absolutely natural state, entirely independent of all the world. self-supporting, self-reliant, simple and competent. Their architecture is the only naturally American architecture in the nation today. All other styles are borrowed from Europe. The manners and customs and style of architecture are the same today that they were before Christ was born. 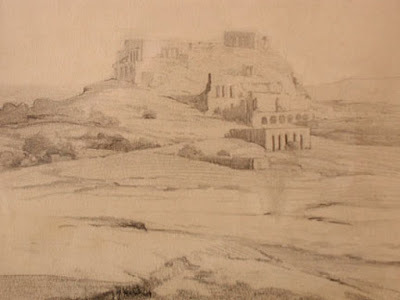 They offer the painter a subject as full of the fundamental qualities of life as did the Holy Land." "The trouble with most people is that they see too much with the eye only and not enough with the inner eye, the emotions,"
he said in 1932. "A painter paints a canvas not because he wants to make a 'picture' as that he wants to solve a problem. A problem in form, in construction, design if you prefer that term, in color harmonies." About Higgins "Little Gems" Blumenschein said, "This last group of pictures I shall never forget. All works of love: love of his simple subjects and of his craftsmanship." Higgins' daughter Joan came from his marriage to Sara Parsons, daughter of Sheldon Parsons. 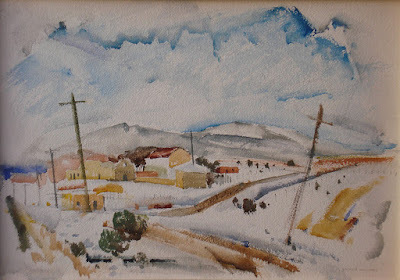 in a small adobe room overlooking pinon dotted foothills and the handsome snow-capped peaks of the Sangre de Cristo Range." Victor was proud of his family and his rural upbringing. 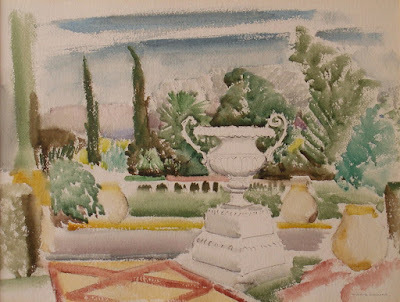 and he tended his garden as a painter might work a canvas." 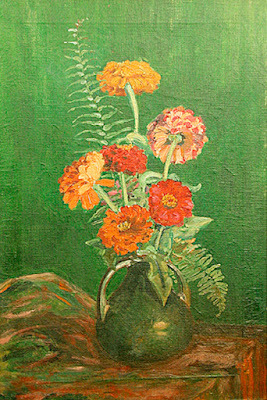 Parsons does not offer Victor Higgins prints, because no print can compare to the real paintings. 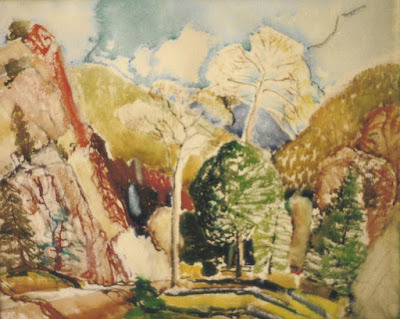 Victor Higgins media include Conte Crayon, Crayon, Oil Paint and Watercolors. Representation, Realist, Naturalism and Realism. Still Lifes, and Cattle or Other Farm Animals in Landscapes. 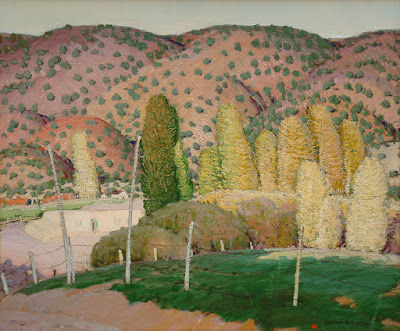 Taos, New Mexico Before 1940, Santa Fe, New Mexico Before 1940 and Cornwall, England. Higgins was born in Shelbyville, Indianapolis, on June 28, 1884. He moved to Chicago in 1899. 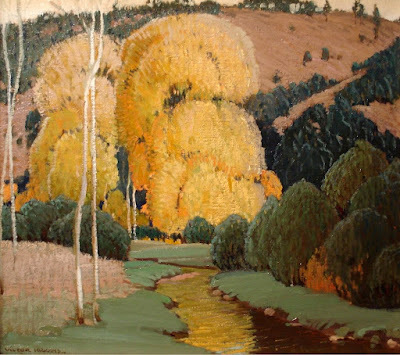 William Victor Higgins studied at the Art Institute of Chicago in 1899. In 1908 he traveled to New York. 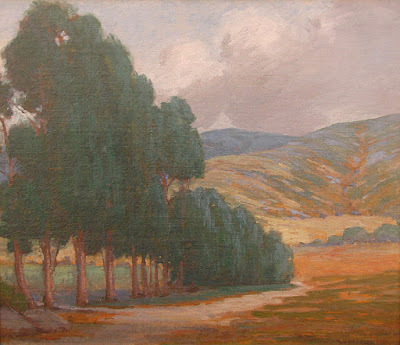 He went to California in 1910, then returned to New York. 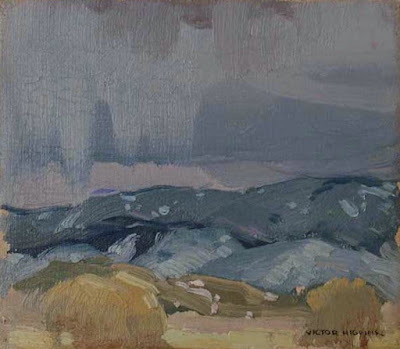 Later in 1910 Victor Higgins traveled to Paris and Munich to study art. He returned to America in 1912. In 1913, he returned to Chicago. 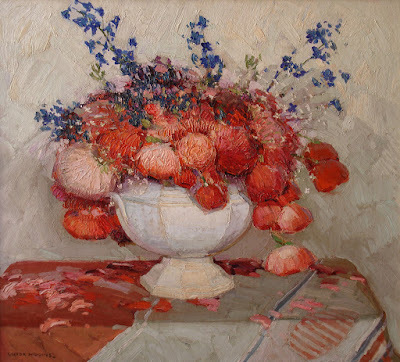 From 1910 to 1914 Victor Higgins studied at the Academie de la Grande Chaumier in Paris. 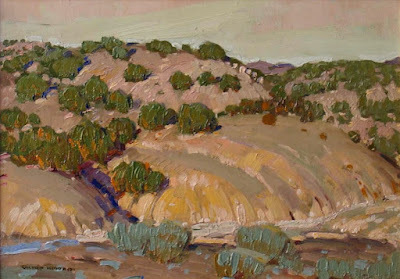 In 1914, Higgins went to Taos to paint landscapes on commission. 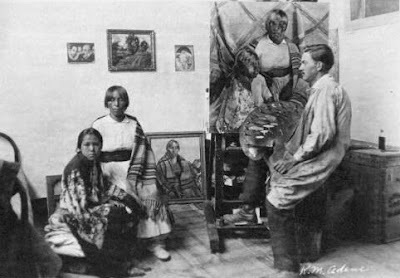 In 1915 he was elected into the Taos Society of Artists. 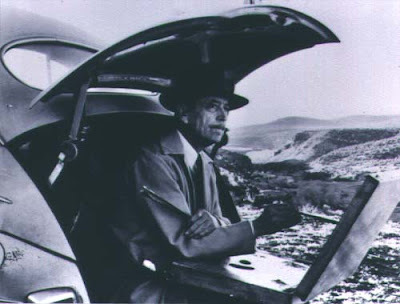 and the First Altman Prize at the National Academy of Design, New York for his work "Fiesta Day". 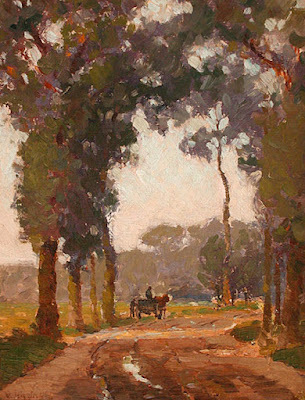 From 1917-1923 he was a teacher at the Chicago Academy of Fine Arts. In 1919, Higgins made murals for the Missouri State Capitol in Jefferson City, Missouri. 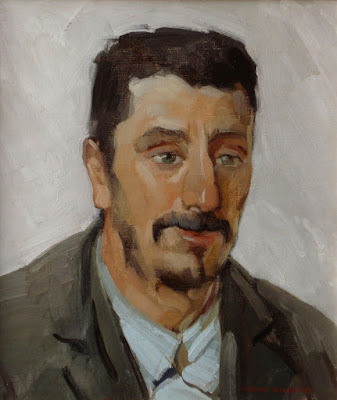 He was elected to the National Academy in 1921. 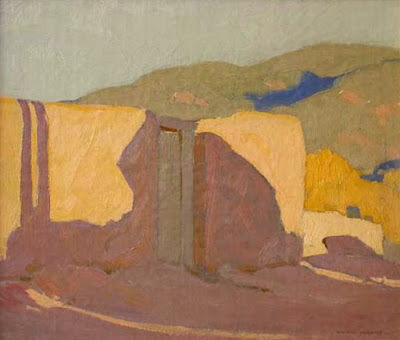 Victor Higgins exhibited at the Museum of Modern Art's second exhibition in 1929. 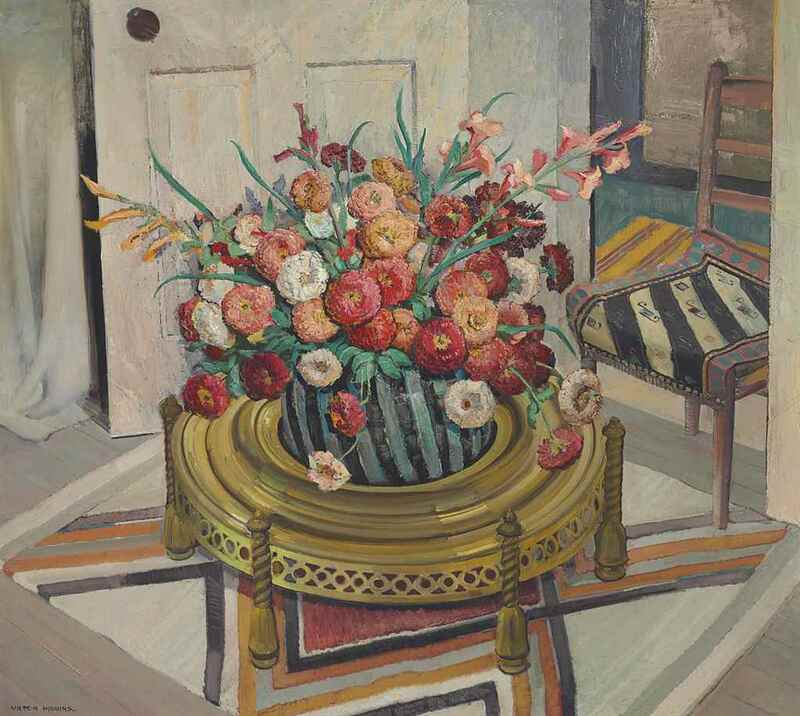 In 1935 Higgins was elected as an Academician of the National Academy of Design. He died in Taos, New Mexico, Aug. 23, 1949. 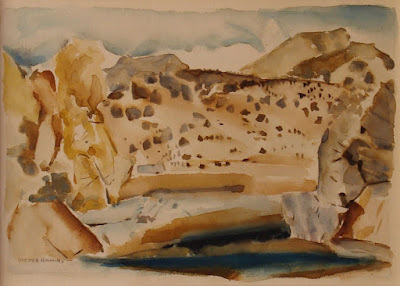 "A Shrine to St. Anthony"
"Valley Town: View of Pueblo Town"
Trustee of the Harwood Foundation in Taos. 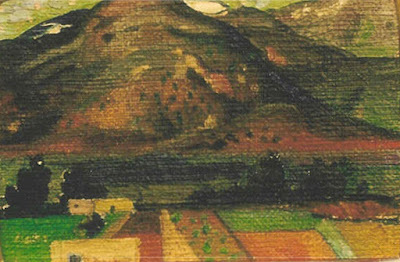 "Oka and Walmacho" 1915 oil on canvas 27 1/16 in. x 30 1/16 in.